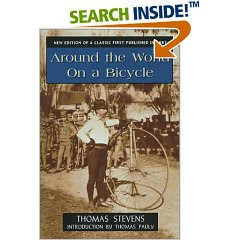 To those who insist our cycling journey through Eastern Europe is nuts, I recite in our defense the extraordinary book by Thomas Stevens, Around the World on a Bicycle, published in 1887! The title is a slight exaggeration. Mr. Stevens -- who rode that wacky contraption with the gigantic front wheel -- did not actually ride all the way around the world. He walked part of it, and skipped part. But I'll give him the title. Born in Britain, Stevens came to Missouri with his family and worked as a miner and mill worker. Somehow he formed a desire to ride around the world on one of those new-fangled bicycle things and bought one for $110, a hefty sum in those days. He left from San Francisco, traveling east, and crossed the United States in a summer. The following year, having prudently used a ship to get to England, he cycled across England, Europe, and through Turkey, and India. Tired yet? The farther east he traveled, the greater the novelty of his bicycle. He attracted larger and larger crowds. In Calcutta, Stevens decided to bypass Burma and Southeast Asia, hopping another ship to Hong Kong. He then pedaled to Shanghai. Another ship brought him to Japan, where he rode from Nagasaki to Tokyo, and finally back home. Stevens has it all over us on some points. First, he went a lot farther. Second, the roads were so bad that he carried and walked his cycle a lot. Indeed, he developed a method of crossing small streams by placing the cycle in the center, bracing his hands on the machine, and vaulting over the water. Third, I think our machines are better designed. Stevens cheerily records a number of occasions on which he took a "header" over the handlebars of his ungainly craft, referred to as a "high wheel" or "penny farthing." Ouch. Also, Stevens carried a pistol at all times, blazing away at passing wildlife. Though he faced some very ticklish threats from the local people in several places in Asia, he never resorted to gunplay. He figured it would only slow down his journey. We're hoping to do as well as Stevens did in finding gracious hosts, shelter, and adequate food. And we are, I must admit, hoping to produce a better book after the ride. I have been slogging through Stevens' tome for some time -- while reading other things, as is my pattern -- and am up to p. 156 (Hungary) out of 470. The prose does not sing. He adopts a bantering, matey, generally patronizing tone about the quaint locals and scenes he encounters. The tone, in short, is entirely tedious and undermines even potentially charming scenes. Still, there are nuggets in the book, such as his ride through the Hungarian countryside with "Igali," with whom he takes turns whistling "Yankee Doodle" and the Hungarian national anthem, occasionally inserting "God Save the Queen" and "Britannia Rules the Waves" in response to Igali's "Marseillaise." Maybe we'll run into Igali's great-great-granddaughter. The spirit of Stevens still lives. Lining up for a parade this spring -- when you're married to a public official you get a convertible so you can drive her through parades -- a squad of "high wheel" cyclists gathered. I sauntered over and mentioned that I was reading about a guy who rode one of those things around the world. 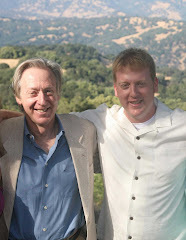 "Oh, yeah," one said, "Thomas Stevens."